So I have two old videos of prepping E for bedtime. One is set for private viewing only because, well because it’s of E taking a bath. It’s kind of hilarious but, you know. 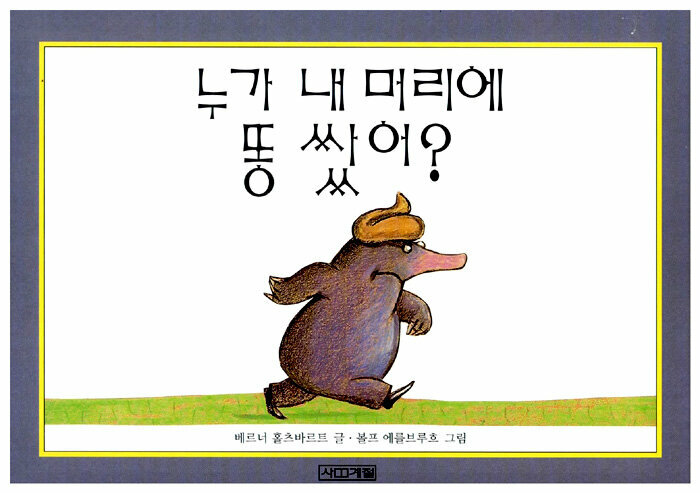 It’s about a mole who comes out of his burrow only to have some poop land on his head and, like the bird in Are You My Mother? , proceeds to interrogate a series of nearby animals as to what happened. It’s twisted and adorable, but you’ll have to forgive my halting reading of it. I am pleased to say that E loves books and loves to have books read to him. I mean to, one of these days, have a run-down of his favorite books, but for now I’ll just share some videos of us reading (and singing). Last summer Dana and I discovered Aladdin Books. They’re an international Korean bookstore chain with a branch down in Annandale, Virginia. One of the best purchases we made there was this combo CD+songbook of fun Korean children’s songs. I swear E already has half the songs memorized; I can barely recall one or two. I know, my pitch control leaves much to be desired. E’s no better. Here he is, climbing out of an ottoman having emptied it of all the board games we store in it, grabbing for the flipcam and engaging in a fairly incomprehensible medley of songs he knows. He eventually runs away with the camera. 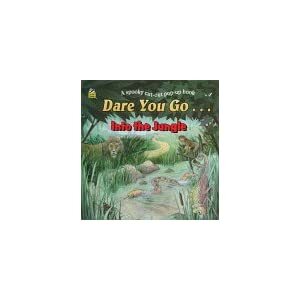 And here I am, reading to E his least favorite book: Dare You Go…Into the Jungle . This was e over the last summer, what I call his Daniel Craig phase. He had his first major haircut, which he got at Chinatown. It took three adults to hold still his screaming little head. One of the smartest things we (okay, my wife) did was notice that e had particular affection for a certain felt-y fabric from the craft store and cut out several large swatches of it — one for his bed, one for our bed, one for the car, one for his grandparents’ house, etc. — so that we were always within arm’s reach of his blankie. Here’s e trying to get a handle on eating yogurt and fruit with a spoon. Bib still needed. And several clips of him eating watermelon. Man, he really likes watermelon. Next week (or so): reading. So I’ve had on backburner a bunch of videos that I’ve always meant to chop together into, I don’t know, something, but — of course — never got around to it. Looking back on them recently, I realized they’re sentimentally great on their own, sans music or editing, and they remind me of how much change e has gone through. First, two clips of e at his 100 day celebration. Here’s him putting on his han-bok (traditional Korean dress). And here’s a bunch of people eating at the buffet. Okay, so this one is not that interesting. Here’s e around that time, I think. He’s pretty helpless, unable even to crawl, really. Here’s him a bit later, climbing the stairs. Sorry about the quality of the video; it was dark in the stairwell. Okay, this next one is fairly long (4 minutes) and features e complaining in babyspeak. I forgot how chunky he used to be. Very cute when he’s cranky. Fast forward a few months, e is mobile. He’s lost the goose-down hair and some of the baby fat. He knows a few words, but still speaks mostly gobbledygook. His articulation is clearer, though, and it’ll be no time at all before he’ll start challenging my Korean. I know this has taken a LONG time, but I finally got around to putting together some vid clips together and posting on Vimeo. This is big-e’s first encounter with the ocean. Even though it’s July in Ocean City (South Jersey), the water has been freakishly freezing all summer. It was a cool last-minute trip: let’s see the beach, eat pizza, and go back home. My first time at Mac & Manco’s, apparently a summer staple for my wife’s family. I’m not normally a fan of just plain cheese pizza, but they had good plain pizza. Yeah, I know the resolution’s crappy. I’ve already posted the photos in the vid earlier. A little video of our trip to the Adventure Aquarium in Camden.